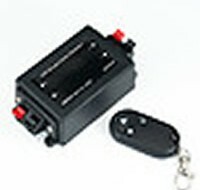 Single channel hand-held remote controlled dimmer which provides an easy way to dim LED lighting products - ideal for residential installations. Positioned between the product and the transformer it dims smoothly or stepped. Standard IR dim signal input and single channel constant voltage PWM output signal. Easy to install via a pair of snap input connections and one pair of snap output connections.